payerPartyReference?, payerAccountReference?, receiverPartyReference?, receiverAccountReference?, paymentAmount?, paymentDate?, paymentType?, settlementInformation?, discountFactor?, presentValueAmount? The value representing the discount factor used to calculate the present value of the cash flow. The currency amount of the payment. 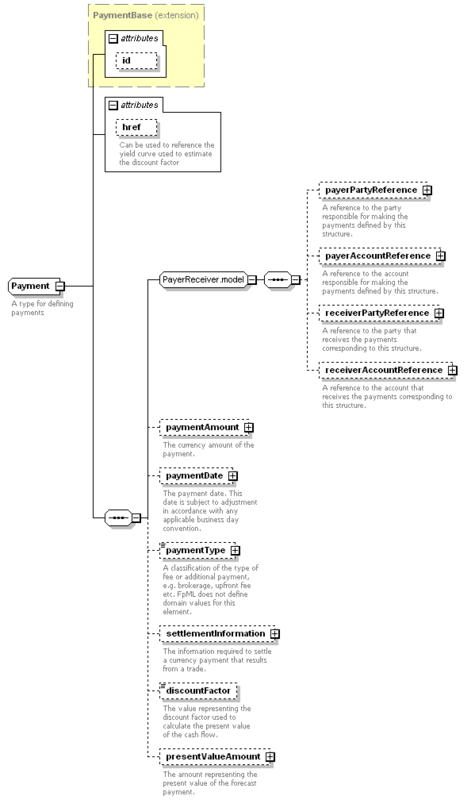 A classification of the type of fee or additional payment, e.g. brokerage, upfront fee etc. FpML does not define domain values for this element. The amount representing the present value of the forecast payment. The information required to settle a currency payment that results from a trade.